The target audience might be children, but that hasn’t stopped a group of four adult men from picking up the brightly-coloured, sizeable tetris cushions and trying to build with them. There are just seven pieces, but it’s possible to make as many as 240 different shapes from them according to the instructors standing nearby. Under the watchful eye of the play area’s monitors, the men – four research scholars at the Indian Institutes of Technology – have been pushing corners of the 3D tetris set together for ten minutes. The shape they are trying to make is on a piece of paper pinned up behind them, and even their instructor seems to be having trouble. The 3D tetris cushions are one of eight games in the play station, whose monitors hope to see more children and teenagers tomorrow when Brazilian Math Olympiad of Public Schools. Next to the tetris, however, there are more groups of adults playing chess on a life-sized board with metre-high pieces. Also nearby, another group is laughing as one uses a square-wheeled bicycle which, in its journey over a ridged platform, is an exercise in understanding circumference. 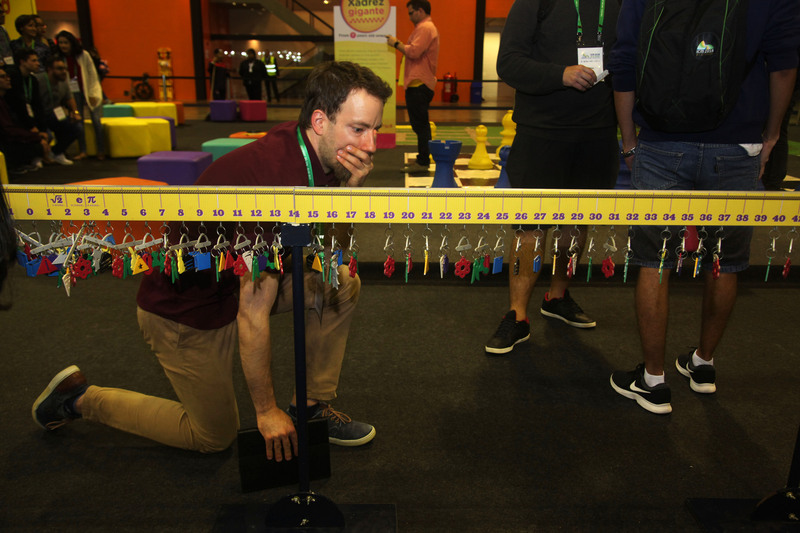 The games, present at the International Congress of Mathematicians (ICM) with the help of the Federation of Industries of Rio de Janeiro State (FIRJAN), are all designed to help children and teenagers engage with mathematics. By including tactile elements within the learning process and gamifying learning, the exercises hope to introduce an element of play to the learning process that will hopefully bolster engagement and increase interest in mathematics among young people. Another stand is showcasing free computer games that can be played online, with levels for everyone from children just beginning to count up to mathematics professors and available in English, Portuguese, Chinese and more. Children are big fans of the brightly coloured, more interactive games such as ‘Deepest Ocean’ and ‘Pyramid Panic’, while adults gravitate towards the games which present plainer visual displays but complex calculations. The takeaway for many of the monitor’s demonstrating and explaining the games, however, is that mathematics can be a game for any age.